Matthew Ralph, Managing Director at GRAF UK, discusses rainwater harvesting’s growing popularity in the public sector and explains how RWH can be bolstered with stormwater management capabilities for even greater savings. Whether it’s because of intense flooding in the winter or severe drought in the summer, rainwater now regularly makes the news headlines in the UK. This is largely down to climate change causing drastic changes to rainfall patterns, accelerated population growth and leakages — all of which mean our groundwater reserves are simply not as plentiful as they should be. In fact, a new report from the Environment Agency has revealed that England will face serious shortages by 2050 unless rapid measures are put in place to curb water use and wastage. This is where RWH comes in, providing an effective way to manage, store and reuse water sustainably, all whilst cutting costs in the process. Considering these economical and environmental benefits, it’s no surprise that demand for large-scale RWH continues to soar. This is particularly true in densely populated urban areas such as London, where the pressure is on from water authorities to reduce mains supply. So how can commercial RWH truly benefit public sector organisations? And how can specifiers get ahead of the curve by combining these systems with stormwater management capabilities for future-proof flood prevention? 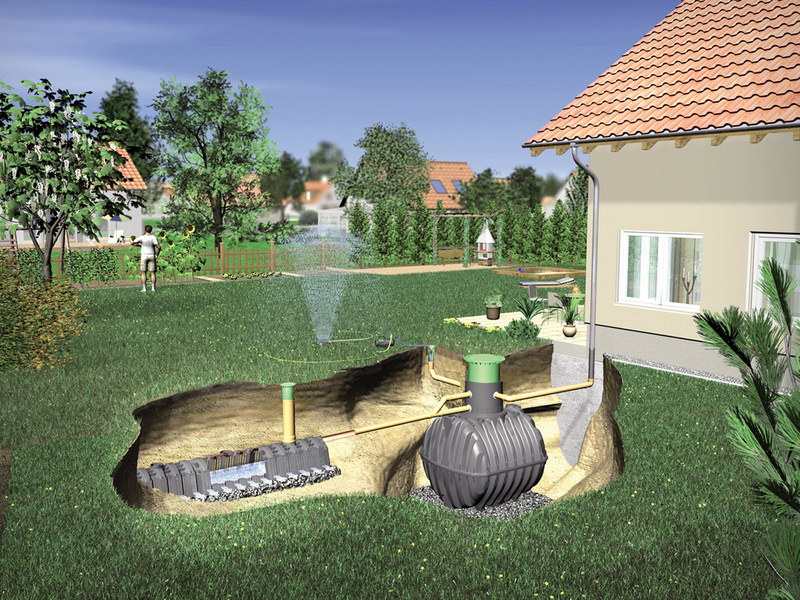 Rainwater harvesting is rapidly gaining recognition in the sector as an effective way to reduce the reliance on (and consumption of) precious potable water from the mains. Water authorities are also actively promoting RWH, encouraging its uptake to help alleviate pressure on what is fast becoming a scarce natural resource. This is easy to understand when you consider that each person in the UK uses around 148 litres of water a day — and that most of it does not actually need to be of drinking quality (e.g. for toilet flushing, cleaning processes, irrigation, car washing and air conditioning). By minimising our dependence on costly water from the mains, RWH can also have a significant impact on bills. In fact, the most efficient systems will reduce mains water usage by between 40 and 50%, which not only cuts costs substantially, but also saves a vast amount of valuable water. It’s important to consider that the larger the building (and its roof area) and the higher its water usage, the more economic sense a RWH system will make. The payback period of installing a large-scale system is usually between three and five years, and with additional tax incentives available to encourage investment in water- saving technologies, the pull is hard to resist. Aside from the positive impact of collecting and reusing rainwater on a large scale, RWH has a significant environmental impact too. It can be particularly attractive for those looking to meet BREEAM criteria (which assess a building’s environmental, social and economic sustainability performance). To achieve the coveted ‘excellent’ rating, new premises must adhere to a number of energy consumption, sustainability and water-saving standards, and with up to three BREEAM credits available for RWH, installing a system can be the deciding factor in reaching the highest possible accolade. While collecting and storing rainwater provides a useful layer of security when it comes to flood prevention by retaining some of the excess water, RWH cannot replace an entire sustainable urban drainage system (SuDS). An efficient, purposed-designed stormwater solution will provide long-term security against flooding and help meet strict run-off requirements set by local water authorities. What’s more, it will also help meet guidelines set out by the Flood and Water Management Act of 2010, which was introduced to develop better resilience to climate change following the widespread flooding of 2007. This ensures effective surface drainage is part of all new development plans. There are two types of stormwater systems: attenuation (where water is retained and then slowly discharged into the surface water drainage system or water courses) and infiltration (where water is gradually released back into natural groundwater reserves) — but the former is much more commonplace in the UK as the clay-heavy soil in many areas of the country is not suitable for infiltration. 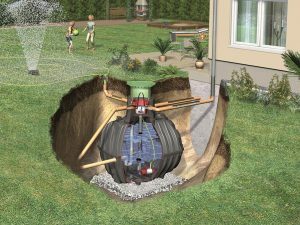 Modular, underground stormwater tanks are proving most popular today as they are less obtrusive than above-ground SuDS and can be installed virtually anywhere. Crucially, they can be combined with RWH in a one-tank solution to become a cost- e ective two-in-one system. This is done by adding a crate-style soakaway or a tunnel system, which is sized according to the infiltration rate of the soil. The most modern tanks (such as GRAF UK’s EcoBloc range) are fully inspectable, featuring inlet shafts and in-built inspection channels to ensure optimum performance and complete peace of mind for the lifetime of the tank. The public sector is under pressure to lead by example when it comes to complying with ever-tightening flood defence regulations and saving what is perhaps the planet’s most valuable resource — water. The good news is manufacturers have been quick to rise to the challenge, and organisations can look to combinable rainwater harvesting and stormwater management solutions to deliver the very best long-term financial and environmental benefits.